The consumerization of IT and the demands of an increasingly mobile workforce are constantly revolutionizing workplace mobility and changing how your organization deals with security. Though you can't stop the loss or theft of devices, there are powerful new ways to ensure enterprise and data security in every scenario. 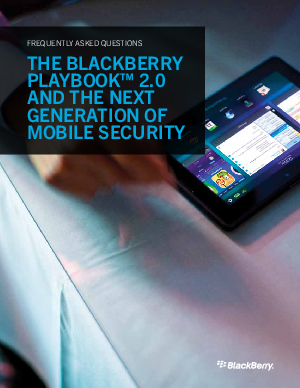 This FAQ explains how BlackBerry®PlayBookTM tablets can be an integral part of an enterprise security strategy. Read now and discover answers to your top mobile security questions.